If someone asked you to name an instrument with keys, you would probably think of the piano, but there are all sorts of instruments with sets of keys, and that keyboard is often all that connects them. Pianos have strings inside them, while the accordion’s squeezebox makes it more like a wind instrument. There are also electronic keyboards, such as a synthesizer, which harnesses electrical currents to create the notes. Here is a small selection of music played by a range of instruments with keys. Pipe organs have existed for many centuries, and come in all shapes and sizes. Their sound is created by pushing air through pipes of different sizes – therefore creating different pitches. Pipe organs are capable of creating lots of different sound colours through ingenious technological variations. They can imitate other instruments, like trumpets, clarinets or flutes. The other amazing thing about most pipe organs is that the player not only uses their hands to create sounds – they use their feet too! Listen to Benjamin Nicholas play the magnificent new (American) organ in the chapel of Merton College, Oxford, where he is Director of Music. He’s playing the beginning of one of Johann Sebastian Bach’s best-known pieces, the Toccata in D Minor. You can also hear the same piece sounding very different played by Eddie Parker on the Moog synthesizer below. 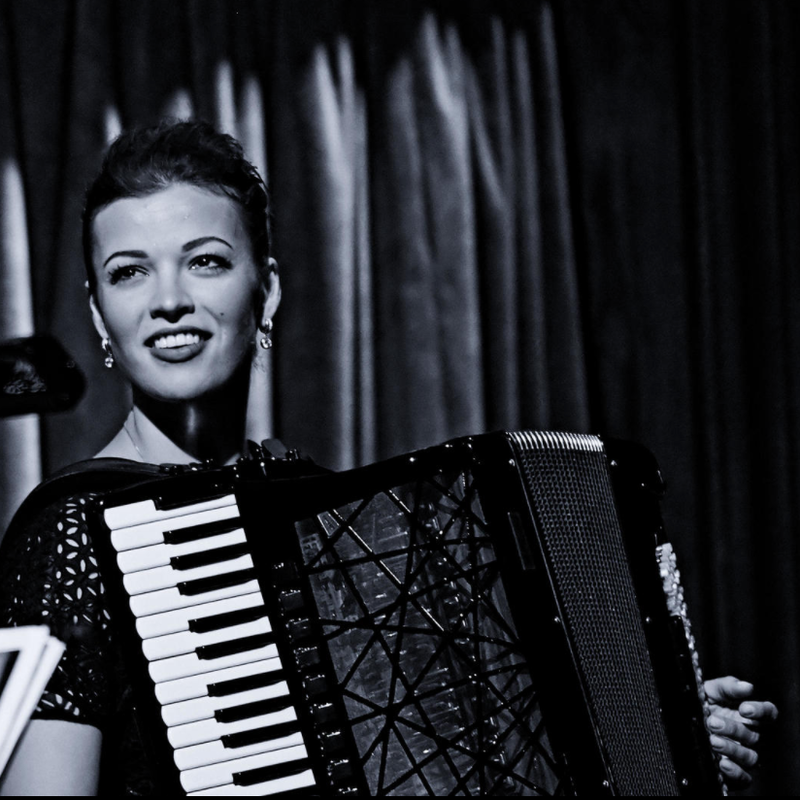 Ksenija Sidorova comes from Latvia, and is one of the world’s most brilliant and charismatic performers of the piano accordion. She was inspired to start playing this instrument by her grandmother’s love of the Latvian/Russian folk tradition. Folk and traditional music from around the world is very closely connected to the family of accordion instruments; Ksenija is passionate about creating new classical pieces too, by asking composers to write for her. There are various kinds of accordion, but what is common to all of them is the ‘squeezebox’ – pleated layers of cloth and cardboard that form a ‘bellows’ chamber of air, and which the player pushes and pulls with their arms. The piano accordion has a conventional piano/organ keyboard on one side of the bellows, and a series of buttons on the other, which also generate different notes and chords when pressed by the players’ fingers. There are other names for the accordion around the world. There is the 'bandoneon' in Argentina – the traditional instrument of tango – and its close relatives the 'concertina', originating in Britain and Germany, the Russian 'bayan' and the 'melodeon'. All of these produce sound the same way as the piano accordion – air from the bellows blowing across metal ‘reeds’ – but they are only button-operated. There is no keyboard! The synthesizer is one of the great musical inventions of the 20th century. There are other, slightly older instruments that use electricity to generate sound – such as the Theremin, the Hammond Organ and Ondes Martenot – but when the American inventor Robert Moog started experimenting in the 1950s with ‘voltage controlled oscillators’ and other fancy electronics, he knew he was on to something. People began to be able to buy Moog’s synthesizers in the late 1960s, and these exciting, futuristic sounds have inspired many rock and pop musicians ever since. Another early Moog enthusiast was Wendy Carlos, who recorded an amazing album of music by Johann Sebastian Bach entirely on Moog synthesizers. At that time, a Moog only played one note at a time, and so Wendy had to add each musical line in layers to the recording. This is exactly what British musician Eddie Parker has done here, with Bach’s organ work Toccata in D Minor: all the different lines of sound have been recorded separately and layered on top of each other. It sounds very different from Benjamin Nicholas’ version of the same piece, doesn’t it?